South Pond Farms is not your typical barn. Instead of farm animals and haystacks, this enchanting farmhouse is constantly metamorphosing into unique spaces for people to gather and connect through agriculture, conversation, nature, and food. Stepping onto the South Pond property is like stepping into a coffee table book. The creative force behind the farm is Danielle French, a mother of four daughters who credits her Vermont roots in playing a pivotal role in her dreamy vision. 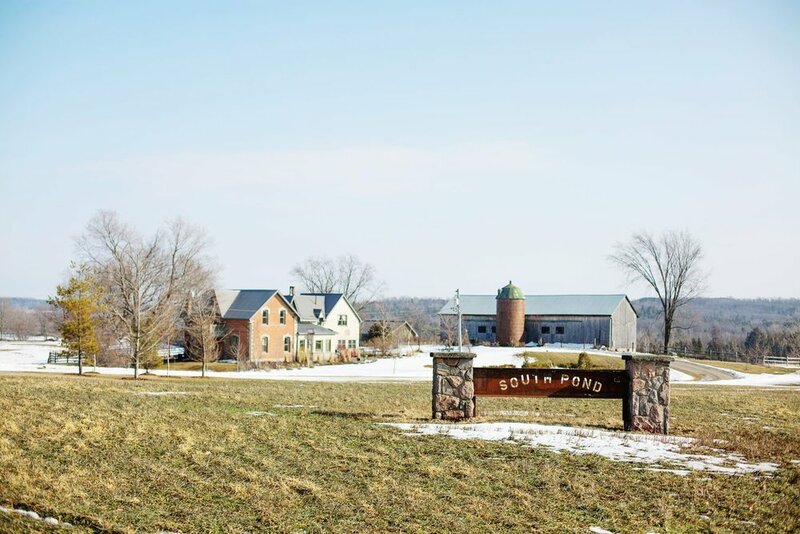 Wanting her daughters to share her grassroots culture, South Pond Farms began as a local food delivery service and has evolved into a beautiful, refurbished barn that hosts seasonal activities, workshops, and events year-round. Alongside her team, French manages a magical destination that has played host to lasting memories (and serious Instagram fodder) for visitors for years. In spring, summer and fall, South Pond Farms is commonly reserved as a backdrop for wedding parties. The barn is unable to host winter weddings as it's not properly heated, but our explorer Kate Watkinson was able to capture the toasty warmth of the farm even in the middle of winter. "I had such a lovely time at the farm," Watkinson reminisced. "Danielle, Chef Kevin, and all the staff at the farm are so welcoming and warm hearted. South Pond Farms boasts charm and beauty. [Everything] from Danielle's beautiful rustic kitchen with the morning and afternoon sun pouring in, to the fields, the forest surrounding the farm, and the outdoor fire pit [is beautiful]. The staff at South Pond Farms are incredibly passionate about the farm itself and what it has to offer to everyone who visits." Chef Kevin McKenna is the culinary genius behind the South Pond Farms. He was trained at the prestigious Niagara-On-The-Lake Culinary School and served as the Executive Chef for various upscale restaurants prior to joining the South Pond team. 65% of all the meals prepared are locally sourced, grown either right on the property or sourced from a neighbouring farm. You can experience this farm-to-table cuisine at South Pond's events like the Country Farmhouse Supper Series (an monthly, intimate farm-to-table dinner with 60 guests), the Full Moon Supper Series, Wednesday Public Lunches, or at Holiday Events that run year round. They even provide dinners for wedding parties. South Pond Farms offer a range of scheduled and private workshops for individuals and groups—current workshops include: Tastings in the Silos, Limb Trimming, Farmhouse Cooking, Flower Arranging, and Honey in the Kitchen (our explorers got to dig their hands into to a bread-making workshop with Danielle and her staff, and it was as delicious as it sounds).